We’ve expanded our most popular language courses to provide a robust learning experience that more accurately measures your language ability through specific achievements along our new Mango Proficiency Scale. Keep reading to find out how you can reference this tool to make the most of your language learning. Proficiency scales are referenced worldwide by educational, professional, and government institutions to standardize language learning and measure language ability. Learning resources with proficiency scales guided by internationally recognized standards prepare you for future opportunities, whether it’s updating your resume (being multilingual makes you more hireable!) or preparing for a language certification exam (language certifications are often required when applying for citizenship or seeking admittance to a university in another country). That’s why we’re introducing the Mango Proficiency Scale along with new content and carefully crafted skill-assessment activities — to bring your learning and our learning system to a new standard. 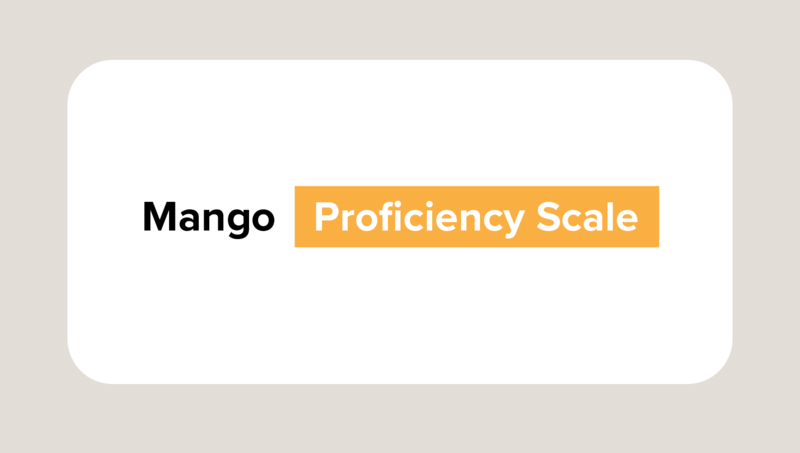 Measuring proficiency in listening, reading, speaking, and culture, the new Mango Proficiency Scale helps learners track specific achievements across eight proficiency levels: Beginner 1, Beginner 2, Skilled 1, Skilled 2, Skilled 3, Pro 1, Pro 2, Pro 3, Master 1, Master 2. For a more in-depth look at the specific achievements and to see how our scale aligns with internationally recognized proficiency scales, check out our Proficiency Scale overview. You might’ve noticed that proficiency levels Pro 1 – Master 2 are not listed in the chart above. That’s because at these levels it’s important to start engaging with authentic content beyond your main Mango lessons — through travel, movies, music, or books in your target language. Mango offers additional resources for daily language immersion, such as Mango Movies, Mango Reader, and Specialty Courses. By using these tools to engage with authentic content, you can effectively craft your own learning pathway toward Pro and Master levels. Whatever your skill level, we’ve got the tools to support the next step in your language journey. Jump back into Mango to take your learning to the next level. What level of proficiency are you aiming for? Share your goals with us in the comments!